The soundboard and inside pipework were bought in Amsterdam by Steve Barrell, keyboard player and scholar. He was told that they came from an organ made by Ludovicus de Backer of Middelburg in Zeeland, the Netherlands, in the mid eighteenth century, and thought that the organ resembled the one depicted in a well-known watercolour painting, illustrated in Jan Gierveld’s Het Nederlandse Huisorgel in de 17de en 18de eeuw (Utrecht 1977). The pipes, as seems to have been usual practice with de Backer, are second hand, and look 17th century in style. The sound is exquisitely sweet. The oak case, keyboard, bellows and action are new, designed by Martin Goetze, based on examples of de Backer’s work in Vlijmen, Oirschot and Gapinge (NL) and in the Vleeshuis museum in Antwerp. The pitch is a¹=432Hz @ 18ºC (the Dutch kamertoon). The tuning is ¼ comma meantone, with pure major thirds. The key compass is 54 notes (C to f³). The pedal keys (pulldowns) provide C to cº. The keys have bone naturals and ebony sharps. The stop knobs are ebony, next to paper labels. The wind system consists of a horizontal single fold reservoir with single fold feeder, activated by a large foot pedal, with the option of an electric blower. There is a typical ‘tell-tale’ in the form of a stop knob on a rod, resting on the top leaf of the reservoir and projecting though the shelf next to the keys. The organ is 12ft high, 6ft 4ins wide and 3ft 4ins deep, which relates to the dimensions given by Rademacher in his journal. The case is made of oak, with the new Quint 2⅔ft pipes in the front. The oak vases on the side towers are turned oak, and the intention is to find a figure similar to the original for the middle tower. The carvings are based on pipe shades on contemporary Dutch chamber organs, in a generally rococo style. 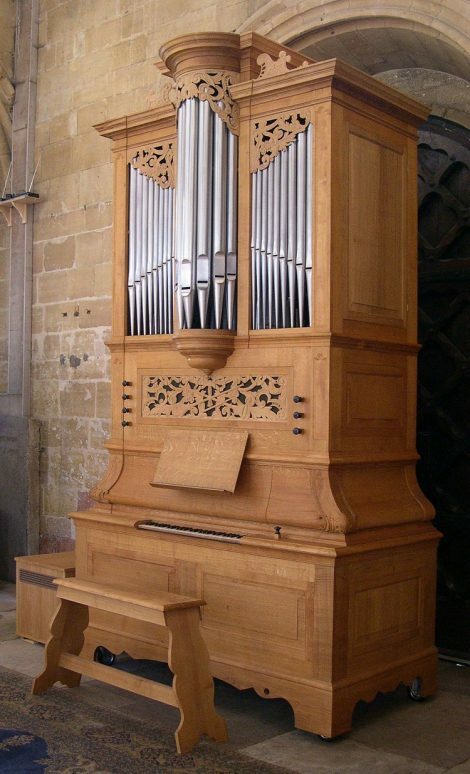 The main use for these organs was, according to Gierveld, the practice and performance of psalms and spiritual songs at home, with instrumental accompaniments, and organ pieces based on the psalm melodies. Psalm-singing at home was increasingly popular through the eighteenth century, both in church and at home, and there was a gradual increase in the number of published books of new translations and new settings. But amateur music was also becoming increasingly popular. At the lowest level this would have consisted of psalm-singing and accompaniment, but some families owned a number of instruments, and a library of music. Inventories of domestic music libraries show the popularity of music published in Amsterdam, most of it by Dutch and German composers, not much by Englishmen, though Handel and Stanley do appear in the lists occasionally.